Star Planet is a new area where you can play a variety of mini-games such as Star Monsteropoly or Star Game of Yut to earn Star Points that improve your Star Grade. The higher your Star Grade the more rewards you can get! In Star Planet, you can also get your fortune told, receive daily buffs, and earn Reward Points. Earn enough Star Points and you can even be chosen as one of the weekly Shining Stars! You become a Shining Star if you are in the Top 100 of the Star Planet Rankings or if you're in the Top 5 of any of the Star Planet game ranking leaderboards when the Shining Stars are selected. When you become a Shining Star you can earn rewards such as a pet and title. You must be Lv. 33 or above to access Star Planet. Star Planet is a shared server so any player from any world can play together in Star Planet! You can select the 'Go to Star Planet' button from the character selection screen to enter Star Planet. You can select the Star Planet button, next to the Cash Shop button, from in-game interface to enter Star Planet. While in Star Planet, certain features, skills, and inventory menus (USE and ETC tab) may not be available. You can use the Star Planet Limousine to travel between the Central Plaza and the Star Arena Street. You can use the Elevators to travel between the Central Plaza and the Star Arena Street. For more information about Star Planet, you can access the Star Planet Guidebook from the Bobble in the Star Planet Lobby. As you earn Star Points from mini-games and events in Star Planet, your Star Grade increases. Once you reach the Star Grade "New Star" you will begin to earn benefits with each new Star Grade you reach. To receive your benefits from attaining new Star Grades, you must talk to Pom Pom in the Star Planet Lobby. Any benefits you attain for reaching a new Star Grade cannot be used if your Star Grade goes below the grade the benefits were awarded at. All players in the top 100 of the Star Planet Popularity Ranking Boards. All players in top 5 of any of mini-games on the Game Ranking Boards. Once selected as a Shining Star you can enjoy all of the benefits until the next Shining Star selection process the following week on Thursday at 12 AM. Post a message to the big screen in the Central Plaza.You can only post a message once ever 10 minutes. Enter the exclusive stage area to the left or right on the Central Plaza screen. You can check to see if you are on track to become a Shining Star by checking out the the Popularity Ranking Board.This leaderboard shows the Star Points status for the top 100 players. You can also search character names to check the points of any player. There is a Popularity Ranking Board both in the Central Plaza and Star Arena. The leaderboard will refresh on every Thursday at 12AM and the top 100 will become Shining Stars. Six mini games have been added for Star Planet Arena. Type the words that appear above the enemies to prevent them from overwhelming the area. Similar to the single player version, in this one, you compete against other players for more points. In this twist on the normal rock-paper-scissors formula, this game tests your quickness and judgment ability by facing Zakum and forcing the outcome that Zakum wants. This is a tactical card game. Four players are required to start a game. Upon entering, each player is given a hand of cards. When it's your turn, you can play cards with the same color or number as the previous card. If you have no cards you can place, you must draw a card from the deck. The goal is to get rid of all of your cards. If you reach 17 cards in your hand, you will lose the game. There are four types of cards: Colored Numbers, Magic, Attack, and Knight. Colored Number: Numbers from 1-6 in each color. Magic: Various effects such as skipping player's turns, changing the color to one of your choice, etc. Attack: Cause the next player to have to take a specified amount of cards. These can be defended by a card that has the same or higher attack power. Knight: Based on the Cygnus Knights, these powerful cards have various special effects. A dice-driven strategy board game. Monsteropoly is a game that is played against two other players. The time limit for one round is 10 minutes. The Heart icon represents the player's resources, used to tame monsters. The Maple Leaf icon represents the player's points, determined by the amount of Hearts and monsters owned. Players will lose the game if their Hearts reach 0. Press the "Roll" button to throw the dice and advance your piece. Rolling doubles will allow the player to roll again. Players can tame the monster on the location they land on with their hearts to make it their area. If players land on their own monster, they may choose to enhance it to increase the monster's attack. When other players land on your area, you will obtain hearts from them based on the monster's attack. Players can also seduce and enhance monsters from other players when they land on the area at the cost of additional hearts. A fully enhanced monster (+3) cannot be seduced by other players. Move anywhere: Allows the player to move anywhere on the board. Enhance a monster: Enhances a monster you own for free. Seduce a monster: Allows the player to select any monster owned by an opponent to seduce. Start: Landing on or passing the starting space will give the player 100 hearts. Potion: Gives the player 100 hearts. Bomb: Decreases the player's hearts by 200. Moon Bunny: This monster starts fully enhanced when tamed. A Korean traditional strategy board game. Compete against another player in the traditional game of Yut. Press the "Cast Yut" button to throw the Yut Sticks. Players can move from 0 to 5 spaces or 1 space back at a time depending on their cast(s). Getting a 4 or 5 will result in an additional cast. Moving onto a space with the player's own piece will combine all pieces on the space, allowing them to move together. Moving onto a space with an opponent's piece will result in it getting captured and sent back to the starting area. If a game piece moves to an 'arrow' space, the character will take a shortcut, bypassing a section of the board. The first player to move all four of their game pieces from the start to the goal wins. For any mini-game that requires more than one player, you can either match to a random player by selecting "Request Game" or play the game with your own party by choosing "Party Play" in the mini-game main menu. Matching to a random player will earn you Star Points and Reward Points and allow your best times to be recorded in the Game Ranking Board. Playing with your own party will not allow you to earn any points or be on the Game Ranking Board for that session. You can check the leaderboard for each mini-game on the Game Ranking Board inside the Star Arena. The leaderboard displays the top 100 for each mini-game, but you can also search character names to rank of any player. The Game Ranking Board will refresh Thursday at 12 AM Pacific and all players in top 5 for each game will be selected as Shining Star. You can customize certain elements of each mini-game in the main menu for each game. For more information about Star Arena mini-games, you can talk to Furball in the Star Arena areas, or the click the question mark icon on the top right of each mini-game main menu. You can also play classic games such as Go Go! Mesoranger (requires 5 people) and Star Omok (requires 2 people) when visiting the Star Game Center in the East Avenue. These games are not ranked and you do not receive any Star Points or Reward Points from these games. While in Star Planet, at the hour mark every hour between 12 PM and 10 PM Pacific you will get an invitation to play Star Bingo. Up to 100 people can participate and prizes are awarded to the first 30 people to get a bingo before 50 numbers are called. The top player also receives a special prize for winning the tournament. You must talk to Floppy to receive your prize. If you have a prize to waiting to be picked up from Floppy, you cannot participate in the any Star Planet world events until you pick up your prize. You get Star points depending on your ranking and the first place winner gets aMaster-o-Bingo Hat: Untradeable, 7 day duration. While in Star Planet, at the :20 mark every hour between 12 PM and 10 PM Pacific you will get an invitation to play 1 vs 100 Rock-Paper-Scissors. This is a survival game where winning or drawing allows you to continue to the next round. Your prize depends on what what round you are able to reach. You get Star points depending on your ranking and the first place winner gets aKemdi Mask: Untradeable, 7 day duration. While in Star Planet, at the :40 mark every hour between 12 PM and 10 PM Pacific you will get an invitation to participate in the celebrity photo op session. Click on Ryan D. and Sierra Grace who will appear in the Shining Star stage to take pictures and get Star Points. The amount of Star Points given will be based on the celebrity's pose. While in Star Planet, at the :30 mark every hour between 12 PM and 10 PM Pacific you will get an invitation to participate in the Lucky Ticket event. If you have 3 Lucky marks on your ticket, you get 1st place. 2 for 2nd place, 1 for 3rd place, and none gets you 4th place. If you get disconnected during the drawing or cancel it, it will count the ticket as being used. You get Star points depending on your ranking and the first place winner gets a Lucky Lucky Hat: Untradeable, 7 day duration. Ancestor's Blessing: 1st and 2nd place winning chance goes up significantly for the Lucky Ticket event. Trial and Error: You can receive a second chance at the Lucky Ticket event. Life Time of Luck in One Shot: All four buffs listed above! The buff received from the Fortune Teller are persistent when moving maps or after reconnecting to the game. You can earn Star Planet EXP coupons in Star Planet by accumulating Star Points and filling your EXP buff gauge. When you access your Character Info, you can check the progress of your EXP buff gauge. You can redeem the EXP gauge once per day and once the gauge is at least 25%. You can select which EXP coupon you receive depending on how much of the gauge is filled when it is redeemed. Star Planet EXP Coupon: Untradeable, 1 day duration, Buff last for 15 minutes. Fine Star Planet EXP Coupon: Untradeable, 1 day duration, Buff last for 30 minutes. Dazzling Star Planet EXP Coupon: Untradeable, 1 day duration, Buff last for 45 minutes. Stupendous Star Planet EXP Coupon: Untradeable, 1 day duration, Buff last for 60 minutes. 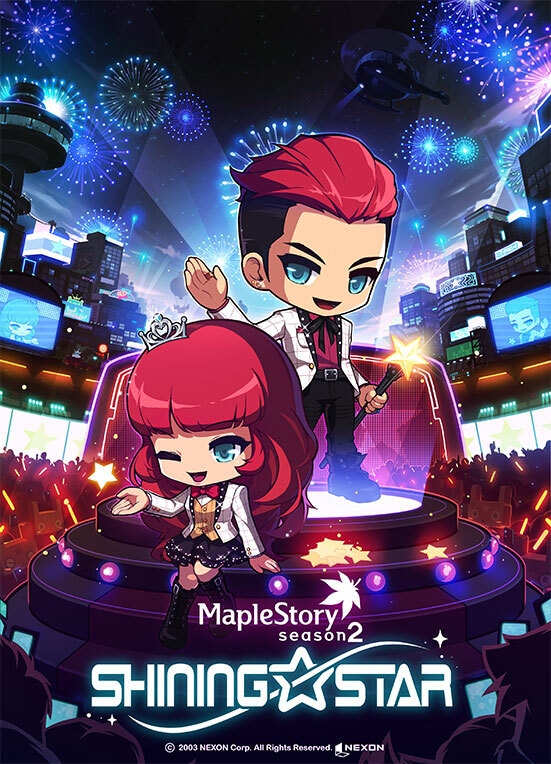 All coupons have a different duration and grant 2x EXP when in Maple World. The coupons do not stack with other EXP coupons.